Fernandez & Leluu: The Hairy Bikers - Wants You! We love watching cookery programmes on TV. What better – midweek, eating your dinner with the telly on. Whether it’s a bit of Sophie Dahl’s dreamy indulgence, to Jamie Oliver’s travels and missions to Gordon Ramsey’s four letter words – they are so much fun and inspirational – eat food, watch food, talk food, think food, see food! 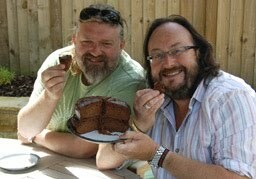 We get some great dinner guests from all walks of life and some from the BBC approached us to write a blog post on The Hairy Bikers as they are looking for contestants to take part in their new show about being ‘Britain’s Best Cooking Family.’ It reminded us of their shows – ‘Mum Knows Best’. Mums do definitely know best. Mums are awesome – they introduced us to the foods we love and they continue to make our best, our favourite and our most loved dish. My mother helps me so much with Vietnamese cuisine as does Simon’s mum advise him on many Spanish and British favourites. She is the actual secret to Simon’s amazing chips! Simon's mum loves The Hairy Bikers! What we love about the Hairy Bikers is that they are no nonsense cooking – they make stuff and its about the taste and how enjoyable it is to cook and to eat. They are not about restaurants and presentation – they are down to earth and appeal to the vast majority of people who aren’t passionate foodies like some of us are and encourage people to enjoy food. There isn’t anything pretty about them – but there is something massively appealing and warm about Simon King and David Myers that is so instinctive and humane. We will be cooking up some of their recipes very soon (we haven’t got much time of late)– and hope that they get to reveal some great secrets passed on from mums and mums of mums and their mums. (or dads).